I know what you’re thinking – another break?! Does this chick ever work?! Answer: Not really. At least in October I didn’t. But those days are long gone. I digress. Anyway, we had about two weeks off for Sukkot break which was nice and a great opportunity to travel abroad which I did not take advantage of. Woops. But I did do a lot of fun stuff! Inbal, the Jewish culture and history teacher at my school, invited any of my roommates who did not have other accommodations for the holiday and myself to her house for Sukkot dinner. One of my roommates and one of my friends ended up accompanying me to dinner. It was a wonderful evening with delicious food. Inbal’s family was extremely welcoming and made us feel at home. 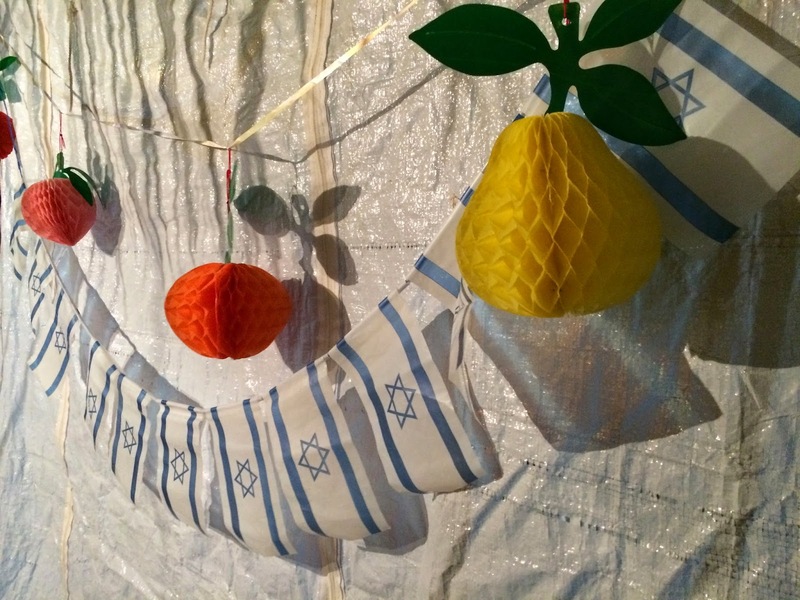 We read a few blessings and toasted in her beautiful sukkah before heading inside her home for dinner. Something really fun and unique that Inbal’s family does for every Jewish holiday is a trivia game full of questions about the holiday’s history. The questions were asked in Hebrew so we didn’t participate much but it was really fun watching Inbal’s family team up and get competitive with the game. Inbal’s family was incredibly hospitable and made us feel as though we were all just old friends meeting for a nice dinner. By the end of the night, Inbal’s 11-year-old son even mustered up the courage to ask my 25-year-old roommate for her phone number. Boys will be boys, am I right? After the first night of Sukkot, the next exciting adventure of the break began on Sunday, the 12th. Our program planned an overnight trip to the north (Naftali mountains, Misgav Am, Mt. Meron, and Tzfat). Some highlights of the trip include a PTK vs Rishon Letzion ITF Master Chef competition, and two hikes that proved just how out of shape I am. We also had the opportunity to listen to an extremely brash Kibbutznik who dubbed himself our “Uncle Aryeh” speak about the Israeli-Palestinian conflict. Uncle A let us know that he did not care to hear our opinions and quite frankly admitted that he believed we had nothing intellectual to offer him. While he upset many people on our program, I was not offended. I obviously did not agree with his demeanor and the way he went about presenting but I did see some value in the message he was conveying. After our trip to the north, 4 friends and I had planned a mini vacation for ourselves to two festivals in Israel. The first was the Tamar Music Festival, which was held at the bottom of Masada (in the Negev desert and right by the Dead Sea). We rented a car and drove out to the festival, which was a lot of fun. We had the pleasure of watching a couple Israeli bands perform and meeting lots of interesting characters. The next adventure of the trip was our sleeping accommodations! Spoiler alert- we slept in a tent without sleeping bags and mats. On top of ALL of the rocks. It is something I can laugh about now but at the time I didn’t actually find it very funny at all. The next morning, after waking up in pools of sweat, we pulled ourselves together and headed out to have breakfast by the Dead Sea. We spent the morning making friends and enjoying the calm before the storm that was our next adventure. We all packed into our humble little dinger and headed to Eshkol, a city that is a short 7-mile jaunt away from Gaza (again, sorry Dad), for the Hot Air Balloon Festival! We arrived at the festival a bit before Sunset and were greeted by hundreds of families with small children. This was very pleasant, of course, given I love children, but I’d be lying if I said I wasn’t a little surprised by the festival’s target audience. I showed up as if it were Coachella just to find out it was more like Disneyland. After our initial shock, we set up camp, snacked, and may or may not have enjoyed a few adult beverages in our tent. Coachella or Hot Air Balloon Festival? Beats Me. We then headed over to see the Hot Air Balloons. They were lovely and all, but I had my eyes on the prize. The prize being the hotdog stand right outside the balloon grounds. My friend Naomi and I have been taking a “hotdog tour” of Israel, and I was excited to taste test the delicacies that Eshkol had to offer. I am happy to say that this hotdog landed third on our list. I blog about all the important things. After this, we returned to our tents for another frigid night without proper bedding. The hot air balloons were set to take off at sunrise, but my friends Jilllian, Naomi, and I were too cold, quite frankly, to leave our humble abode. A little ridiculous, sure, but no regrets. Once morning struck, we packed up and headed back to return our rental vehicle and said goodbye to two days filled with laughter, discomfort, and good times.